The persecution of Catholics in Vietnam began in 1640 and escalated into 1798 when the Nguyen Dynasty decreed Catholicism as “a religious sect introduced by foreigners to rally the working class to revolt against the ruling dynasty.” All 37 parishes in Dinh Cat were attacked and churches were destroyed, and more than 100,000 Vietnamese Catholics died as martyrs. 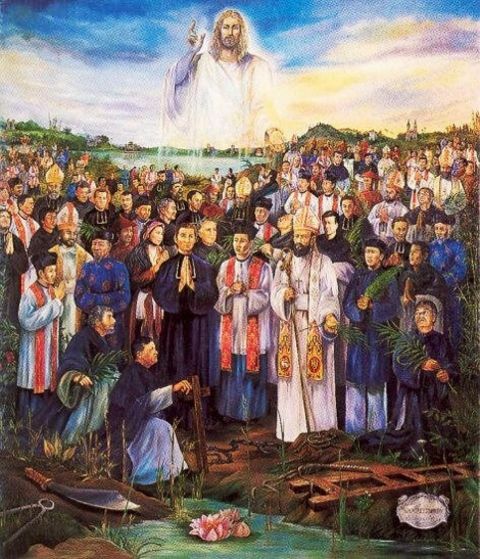 More than 100,000 martyrs for the Catholic faith in Vietnam 1640-1798. Many Catholics took refuge in the deep jungle of La Vang near Quang Tri, but they experienced hunger, sickness, dangerous animals, starvation, and bitterly cold weather. They prepared themselves for martyrdom. But, they would still pray the rosary every night, huddled together at the foot of a large banyan tree. One night in the jungle in 1798, they were unexpectedly visited by an apparition of a beautiful Lady among the branches of the tree. 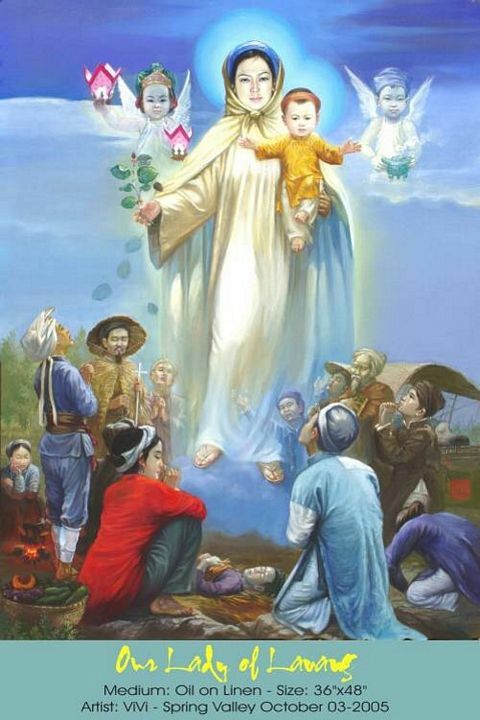 She appeared in a long cape, wearing a traditional Vietnamese long dress (“ao dai”), and holding a child in her arms. There were also two angels –“like bright lights” — at her sides. She comforted and reassured the sick and weary refugees. She told them to boil the leaves from the surrounding trees to use as medicine. She stated that all who would come to this place would have their prayers heard and answered. This all took place on the grassy area near the big ancient banyan tree where the refugees had been praying. All those who were present witnessed the miracle. The sick were healed. By 1802 they could return to their villages. The Virgin Mary appears in a banyan tree in the jungle of Vietnam in 1798. They erected a small and desolate chapel in her honor in 1820. 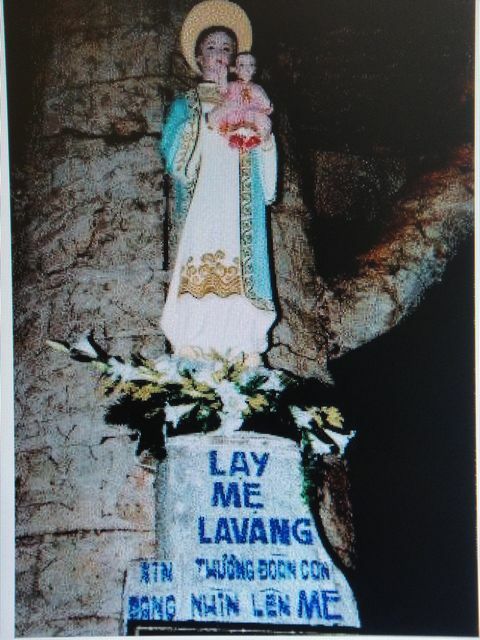 Despite its isolated location in the high mountains, groups of people continued to find ways to penetrate the deep and dangerous jungle to pray to the Lady of La Vang. Many prayers have been validated as having been answered. Gradually, the pilgrims that came with axes, spears, canes, and drums to scare away wild animals were replaced by those holding flags, flowers, and rosaries. Despite the ongoing persecution campaign, pilgrimages continued every year. The Virgin gives directions for boiling ferns and leaves as medicine for the ill.
Another wave of persecutions from 1830-1885 decimated the Christian population and destroyed the chapel. With the persecution ending in 1885, Bishop Gaspar ordered a new church to be built on that location to the Lady of La Vang in 1886. Because of limited funding and its remote and difficult location, it took 15 years to complete. On August 6-8, 1901, Bishop Gaspar inaugurated the new church in a solemn ceremony attended by 12,000 people! By 1928 a much larger church was needed and replaced the old one. 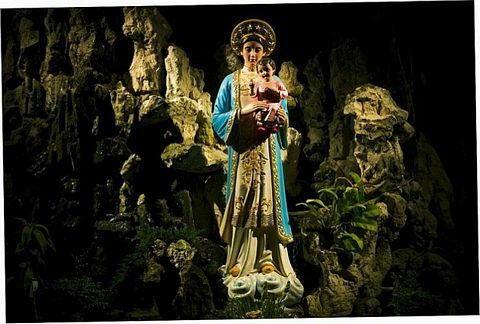 In 2013, there was a report acquired from a Vietnamese pilgrim that Mary’s statue at the shrine had been weeping tears in recent years.